This tuberous plant comes from southern Europe and is now widely naturalised in Britain. One of the first flowers to appear from mid January it is a very welcome source of early nectar, as our picture illustrates. In Suffolk the yellow flowers have been named ‘choirboys’ because of the ruff of leaves that surrounds them. They will grow happily in both sun and part shade but prefer a moist, well drained soil. A good way to get more of them is to lift a clump after flowering has finished in spring, split up the tubers into smaller clumps and replant them. Make sure you don’t let them dry out in the process. Winter aconites are part of the buttercup (Ranunculaceae) family, a primitive group of plants which has all its floral parts (petals, sepals, stamens and pistils) separate from one another. A good way of recognising flowers in the buttercup family is the multiple, simple pistils at the centre of the flower, which often have a hook at the tip. The predominent property of plants in the buttercup family is an acrid glycoside which is poisonous and fortunately very unpleasant to taste. 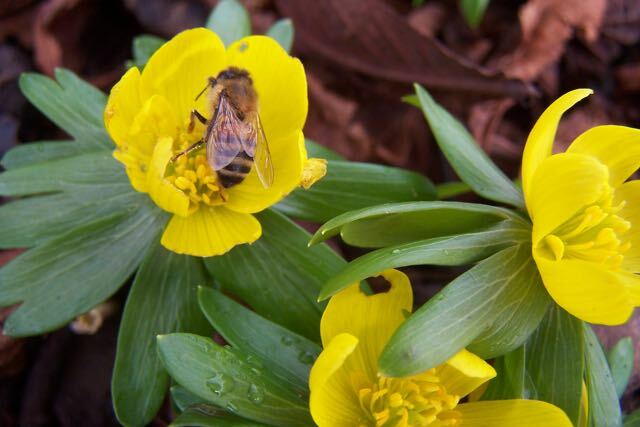 Winter aconites are only mildly poisonous, but will cause a stomach upset if ingested. It is one of the few flowers that the rabbits leave alone at Cressing!